Twenty of cinema’s most powerful voices will speak on the state of the nation in “amBisyon2010” this Sunday (Mar 7), 10:15 pm on the “amBisyon2010 TV special” on ANC (SkyCable ch. 27) and simulcast on ABS-CBN's "Sunday's Best." 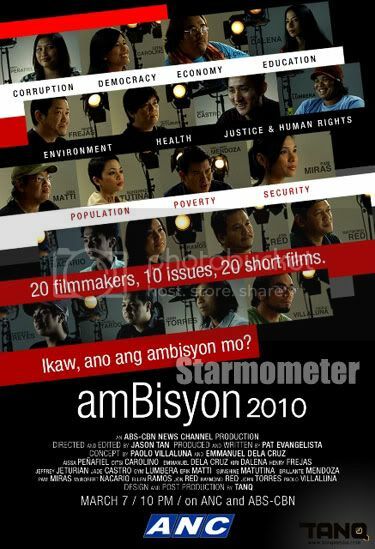 “AmBisyon2010,” a project of ANC, gathers 20 Filipino filmmakers to create films on the ten issues that will determine the 2010 elections. Given film grants and full creative freedom, the directors have offered their talents for free in this monumental collaboration. “This is a chance for me to say my piece on the state of the country and how it’s being run by our leaders,” said acclaimed TV and film director Jeffrey Jeturian. Cannes Film Festival winner Brillante Mendoza says he wants to show truth. “I was asked before, bakit puro kahirapan ang pinapakita mo sa Pilipinas? Gusto kong ipakita ‘yun kasi ‘yun ang realidad. I’m showing this because I have hopes,” he said. Scorpio Nights 2 and Mano Po director Erik Matti says he doesn’t trust most of the presidential candidates—“They’re not really presidentiables, but they all want to be presidents!” He hopes the 20 films will connect with viewers and help them make their decisions in the polling booth. Matti’s animated “Da More Da Menier” is a tongue-in-cheek look at population with a white-breaded God, dancing cavemen, and an apple shortage in the Garden of Eden. 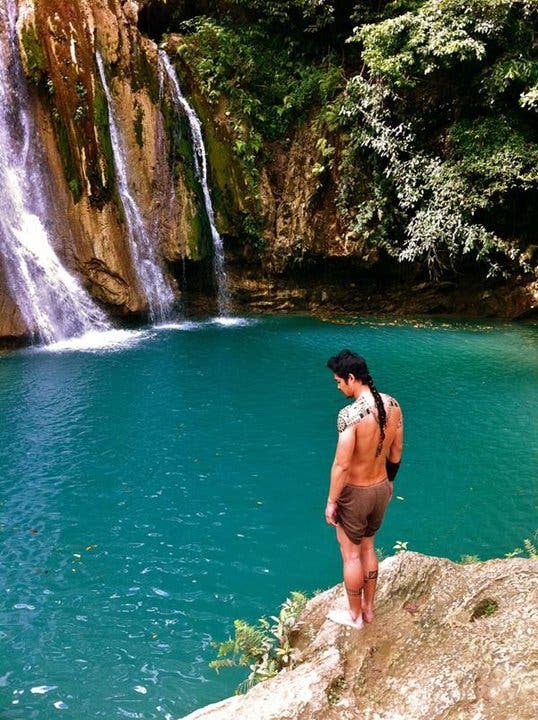 Joining Matti, Jeturian, Dalena and Mendoza in the project are ten other respected names in the Philippine film scene – Ditsi Carolino, Emman Dela Cruz, Henry Frejas, Jade Castro, Ellen Ramos, Jon Red, Jerrold Tarog, John Torres, Paolo Villaluna, and Raymond Red as well as promising directors Sunshine Matutina, Pam Miras, Aissa Penafiel, Emerson Reyes, Gym Lumbera, and McRobert Nacario. 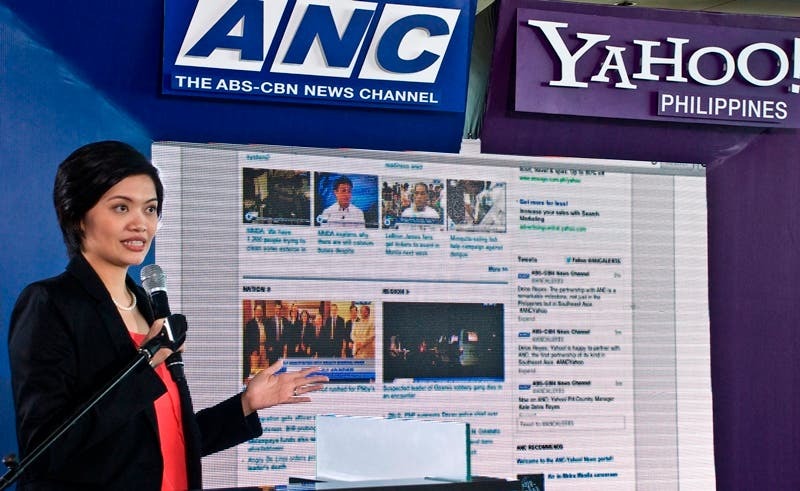 “AmBisyon2010” will also have a grand theatre screening on April 6, followed by a five-part television premier of the 20 films on ANC starting April 10.